Can the use of medicinal plants motivate forest conservation in the humid mountains of Northern Oaxaca, Mexico? 1 Postgrado en Botánica, Colegio de Postgraduados - Campus Montecillo, Texcoco, Estado de México, México. Non-timber forest products are being integrated into conservation strategies. Their relevance for obtaining medicinal plants is frequently cited as a reason to conserve forests. Can the use of medicinal plants motivate forest conservation? 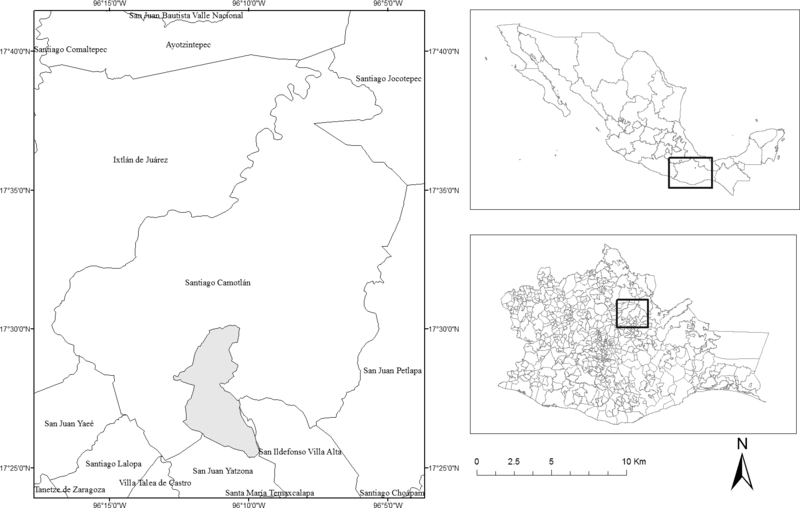 The study was conducted in Santiago Camotlán, Distrito Villa Alta, Oaxaca, a humid mountainous area in the Sierra Norte of Oaxaca, Mexico, from August 2011 to May 2013. Ecological Land Units were characterized, and the relative importance of medicinal plants was evaluated. The ethnobotanical methods included participatory mapping, open interviews, semi-structured interviews and free lists with local healers, as well as members of 17 systematically selected households. Medicinal plant species, and plants considered characteristic for an Ecological Land Unit by local specialists, were collected during plant walks with both healers and experts on the territory. For each species, a newly proposed Knowledge, Use and Perception Index based frequency of mention in free lists, frequency of use and perceived importance was calculated. Local people divided their territory primarily by physical geographic characteristics and utilization. Nine units were distinguished: village and roads, home gardens, pastures, cultivated fields (maize, beans, sugar cane and coffee), cloud forest, semi-evergreen tropical forest and evergreen tropical forest, secondary vegetation ("acahuales"), and riparian vegetation. The most important medicinal plants were Salvia microphylla, Lippia alba and Artemisia absinthium, all cultivated in home gardens; weedy vegetation provided the majority of all medicinal plants. Individuals interested in preserving medicinal species transplanted them into a home garden. For people in the study area, the presence and use of medicinal plants was not a decisive reason for forest conservation. Los productos forestales no maderables están siendo integrados en las estrategias de conservación. Su relevancia para la obtención de plantas medicinales se cita frecuentemente como una razón para conservar los bosques. ¿El uso de plantas medicinales puede motivar la conservación de bosques? Sitio y años de estudio. El estudio se llevó a cabo en Santiago Camotlán, Distrito Villa Alta, Oaxaca, en un área montañosa húmeda de la Sierra Norte de Oaxaca, México, de agosto 2011 a mayo 2013. Se caracterizaron unidades ambientales y se evaluó la importancia relativa de las plantas medicinales. Los métodos etnobotánicos incluyeron mapeo participativo, entrevistas abiertas, entrevistas semi-estructuradas y listados libres con curanderos, así como miembros de 17 hogares seleccionados sistemáticamente. También se recolectaron en caminatas botánicas, plantas medicinales con curanderos y plantas consideradas características de cada unidad ambiental por conocedores del territorio. Para cada especie se calculó un índice nuevo, de Conocimiento, Uso y Percepción, basado en frecuencia de mención en listados libres, frecuencia de uso e importancia percibida. La gente local dividió su territorio principalmente por características geográficas, físicas y utilización. Se distinguieron nueve unidades: pueblos y caminos, huertos familiares, potreros, campos de cultivo (maíz, frijol, caña de azúcar y café), bosque de niebla, bosque tropical semiperenne y bosque tropical perenne, vegetación secundaria ("acahuales") y vegetación riparia. Las plantas medicinales más importantes fueron Salvia microphylla, Lippia alba y Artemisia absinthium, todas cultivadas en huertos familiares. La vegetación herbácea secundaria proporcionó la mayoría de las plantas medicinales. Los individuos interesados trasplantaron las especies medicinales en sus huertos como medida de preservación. Para la población del área de estudio, la presencia y uso de plantas medicinales no fue una razón decisiva para la conservación de bosques. Worldwide, tensions and synergies between the conservation of biological and cultural traits, sustainable use of resources, food security and health of rural communities is widely discussed (Cunningham 2001, Ladio 2006, Rockström et al. 2009). One recent focus is the distribution, management and conservation of non-timber forest products, particularly edible and medicinal plants. They are among the most important resources in terms of quantity and value to rural people, often second only to firewood, and the nutrition and health of millions of people depend on them (Schippmann et al. 2002, Hamilton 2004). Studies of the management and conservation of forests necessarily include the role of local perceptions and regulations, conservation of sacred sites and the influence of local leaders, both political and spiritual (Byers et al. 2001, Colding & Folke 2001, Tiwari et al. 2010). “Medicinal plants” is usually the category with the largest number of known useful species in ethnobotanical surveys. Globally, about 10 % of the total flora is thought to have medicinal uses (Schippmann et al. 2002). In Mexico, Caballero & Cortés (2001) published the results of a literature review and counted 2,140 species, about 7 % of the total flora, but their list is probably still incomplete. Many medicinal plants are gathered from wild populations. Often, studies on medicinal plant conservation are focused on documenting the impact of gathering, attempting to determine an amount that would be sustainable (van Andel & Havinga 2008, Kandari et al. 2012). Others analyze species at risk and propose conservation measures. Some try to identify priority species for conservation based on their characteristics or local importance (Albuquerque & Oliveira 2007, Oliveira et al. 2007, Kisangau et al. 2011). Few studies report on the perspective of the local users or their own conservation measures. The exact vegetation type that provides the medicinal plants is not frequently investigated, and results of the few existing studies appear to differ among regions and cultures. Some studies in Africa, Asia and South America show that most medicinal plants grow in conserved forests (Brazil, caatinga – Albuquerque 2006, Tanzania - Kitula 2007, Ethiopia - Kandari et al. 2012, Argentina - Molares & Ladio 2012). This is reinforced by some local beliefs that plants from wild vegetation are more effective (Kandari et al. 2012, Molares & Ladio 2012). Sometimes spiritual-religious reasoning is involved (Lulekal et al. 2008, Megersa et al. 2013). Based on these studies, some authors propose to integrate these species into local conservation strategies (WHO et al. 1993, Balick & Cox 1996, Schippmann et al. 2002, Hamilton 2004). However, studies in Mexico and some other regions point to human-influenced vegetation as the most important source of medicinal plants (Oaxaca - Frei et al. 2000, Mexico – Caballero & Cortés 2001, Chiapas - Stepp & Moerman 2001, Surinam - Van On et al. 2001, Nepal - Rokaya et al. 2012). Thus, in Mexico, the importance of less disturbed vegetation as a source of medicinal plants requires more detailed study. Cunningham (2001), after working with people whose conservation of vegetation was motivated more by religious beliefs than ecological reasons, asked whether people really conserve habitats because useful plants grow there, or rather for other reasons. This investigation asks whether the value of medicinal plants for local people (in a broad sense, not necessarily monetary) can motivate conservation of their forests. This includes where people obtain their medicinal plants, if they use plants from forests, if these medicinal plants are important for them, and if their use is currently or potentially important enough to motivate the conservation of forests. This knowledge is essential to design forest policy that is locally appropriate. The study area was particularly suitable for this study because it has only been under strong external cultural influence since the 1990s. Moreover, it has extensive well-conserved natural vegetation and a functioning system of traditional medicine as well as a local government operating under communal norms. 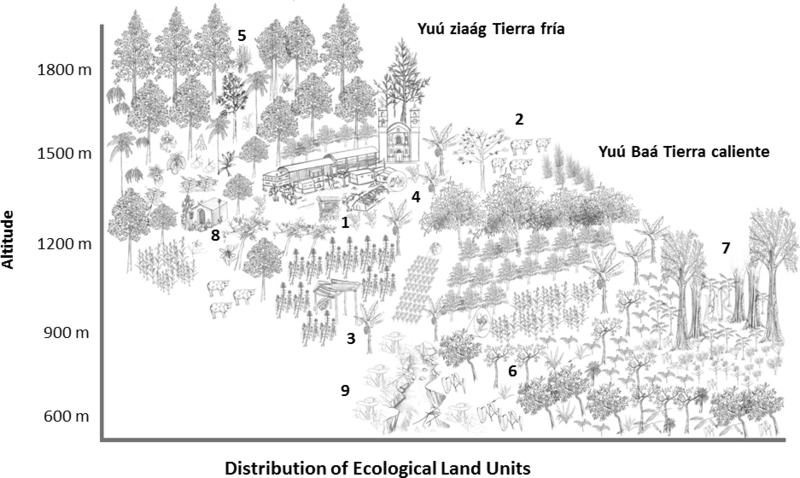 The concept of Ecological Land Unit sensu Sayre et al. (2014) used in this study refers to an “area with a distinct bioclimate, landform, lithology and land cover”, land cover meaning vegetation or manmade surfaces (such as roads). Thus, human action and organization is an integral part of the concept (Boege 2000, Paredes-Flores et al. 2007, Urquijo & Bocco 2011). Overview. Ecological Land Units were circumscribed based mainly on local criteria. Then, we identified the local medicinal plants and the vegetation types where they were obtained. We assigned a value to the plants based on frequency of mention in free-lists, recent use and perception of value, obtained in structured interviews. These data were then put into perspective with the results of in depth interviews with healers, experts on the territory and the general population on uses, motivations and conservation. The study area. Santiago Camotlán is located in a relatively remote part of northern Oaxaca, Mexico, in the eastern part of a mountainous region called Sierra Norte or Sierra de Juárez. 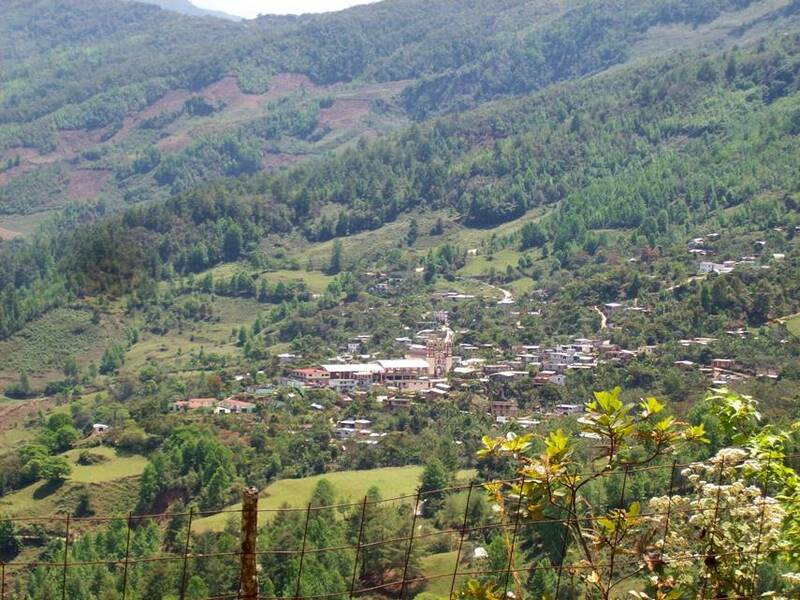 It is both a community and municipality within the District of Villa Alta, Figure 1, with elevations between 600 and 2,000 m and frequent steep slopes. The municipal seat is 1,400 m above sea level, Figure 2. Average annual temperatures vary from 16 to 26 °C, that is, climate ranges from temperate to tropical. Climate maps (INEGI 2005) distinguish five climate types within two major divisions. A large part has very high year-round rainfall, up to 4,000 mm/yr (semitropical-humid, 49 % of the area, tropical humid, 33 %) and the rest has less rain (around 1,500 mm/yr) and a dry winter season (tropical humid, 11 %, temperate humid, 7 % and semitropical humid, 0.1 %). The region has one small permanent river, the Cajonos, and several seasonal ones; it is part of the Papaloapan river basin. Soils are highly variable and derive from both volcanic and sedimentary material (Centeno-García 2004) and form acrisols, cambisols, lithosols, phaeosols, luvisols, nitisols and regosols. The most common soil type is humic acrisol, rich in organic matter, but quite acid and infertile (Alfaro-Sánchez 2004, INEGI 2005). Figure 1 Map showing the location of the study area. Figure 2 Landscape surrounding Santiago Camotlán, Oaxaca, Mexico. The municipality includes large tracts of little-disturbed forests that harbor animals such as jaguar, tapir and monkeys (Contreras-Díaz & Pérez-Lustre 2008). Forest types consist of cloud forest, semi-evergreen tropical forest and evergreen tropical forest (illustrations in Supplementary Material 1), and the area is considered a priority area for conservation (Torres-Colin 2004, (DOF 2007, Arriaga-Cabrera 2009) but is not yet formally protected. The village received payments for environmental services for conserving its cloud forests. Secondary vegetation included cultivated areas (maize, beans, coffee and sugarcane), pastures (mainly for cattle) and regrowth shrub and forestland, the acahuales. The urban areas had roadside vegetation and home gardens. At the time of the study, the community had a population of less than 900 individuals (IMSS 2013); the livelihoods of most people were based on agriculture and cattle ranching. There was some commerce and services. Zapotec, Chinantec and Mixe ethnic groups were represented in the population. The main indigenous language was Zapotec (De Ávila-Blomberg 2004) but most people spoke Spanish as their first language. Land ownership was communal, but customary rights to certain plots of land existed. There were municipal, agrarian and church authorities; important decisions were made in community assemblies that still functioned in this region (INAFED 2010). A rural government clinic had a permanent nurse and a visiting physician. The community also had a traditional doctor, several healers with different specialties (bonesetter, midwife, and specialists for other illnesses). There was very little medicinal plant commerce in the community (only one very occasional itinerant vendor), and every medicinal plant collected was used locally. Classification and description of the Ecological Land Units (August 2011-September 2012). The project was presented and consent obtained first from the municipal and agrarian authorities, and then from the community in an assembly. In this assembly, we also solicited consensus proposals of people considered experts on the history and the territory of the community; the result was a group of five men and two women, who agreed to participate. 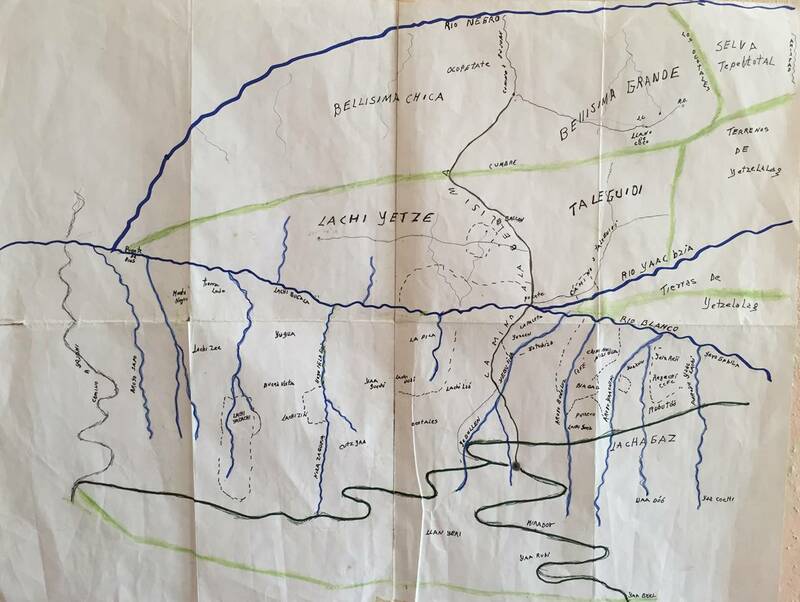 In order to characterize and delimit the Land Units, the identified experts were asked in a meeting to draw their territory on a large sheet of paper (about 60 × 60 cm) and to include important reference points (participative mapping, Figure 3). Then, the study area was circumscribed by a polygon based on coordinates of a local community development plan (ECOPRODES 2011). With a size of about 27 km2, it was smaller than the municipality. A large part of the study polygon had very high year-round rainfall, up to 4,000 mm/yr (semitropical-humid, 49 % of the area, tropical humid, 33 %) and the rest had less rain (around 1,500 mm/yr) and a dry winter season (tropical humid, 11 %, temperate humid, 7 %, and semitropical humid, 0.1 %). Figure 3 Map of the study area made by local people of Santiago Camotlán, Oaxaca, showing their criteria for structuring landscape. Then, the study area polygon, the map made by the experts and an image Spot Google Earth (2014) were integrated with the help of the mapping software ILWIS, ver. 3.5. In individual meetings, the experts on territory were interviewed in depth (Sheil et al. 2002) on the classification of their territory, land use, vegetation classification, soils, climate, the community, disaster areas, sacred sites and important events. We also interviewed the community authorities on these subjects. With the help of these experts, two routes were drawn which, according to them, covered all of the vegetation types. The routes were walked eleven times in company of seven experts (separately) throughout one year, between December 2011 and September 2012. During the walks, plants considered characteristic (not necessarily dominant) for an Ecological Land Unit by the guides were collected and later identified at CHAPA (Herbario-Hortorio of the Colegio de Postgraduados), ENCB (Herbario de la Escuela Nacional de Ciencias Biológicas, Instituto Politécnico Nacional, Mexico City) and MEXU (Herbario Nacional, Instituto de Biología, Universidad Nacional Autónoma de México, Mexico City); the vouchers were deposited at CHAPA. Open interviews during these walks, and other field work helped to clarify and define the Ecological Land Units used to classify the origin of the medicinal plants. The medicinal plants (September 2012 to May 2013). We worked with two groups of people in order to obtain a list of local medicinal plants, evaluate their relative importance and their distribution in Ecological Land Units. The first group consisted of healers, seven people who were locally recognized and agreed to participate (three of them were also in the group of experts on the territory). They included one man considered a traditional doctor (age 50), and six women: two midwives ("partera", 46 and 54), a bonesetter ("huesera", 37), a general healer ("curandera", 48) and two specialists in home remedies (composite medicinal preparations called "remedios", 56 and 72). family members were away at that moment (they were not included), but some also declined. First, both groups were asked the same questions: Which medicinal plants do you know (free list)? Where do they grow? Which medicinal plants did you use in the last year? Which medicinal plants do you consider most important? Then, the plants mentioned in the interviews were collected with the help of the healers. They were identified and deposited in the same way as the plants collected for the description of the vegetation. The collections included both spontaneous and cultivated plants; 14 well-known cultivated plants were not collected but identified in the field and are indicated in the species list (Appendix). We also observed and documented the presence and absence of the medicinal species in the different Ecological Land Units. Further information on their distribution was obtained from the healers. Importance is a diffuse term that can include economic relevance, use value, cognitive salience, position in a cultural domain and others. In ethnobotanical studies, a number of indices are employed, depending on the aim of the study (Phillips 1996, Hoffman & Gallaher 2007). For example, cognitive salience may be measured with the number and position of species in free lists (Reyes-García et al. 2006). Informant consensus or ratings may be used to analyze cultural significance (Lozada et al. 2006, Molares & Ladio 2009); the number of uses a species has, or the number of illnesses treated in the case of medicinals (Phillips & Gentry 1993a,b, Phillips 1996, Albuquerque et al. 2007) can measure use value. However, for the individual person, "importance" may include aspects of all of these factors (economic and social). As we wished to integrate the perspective of the studied population (Byg & Balslev 2001) and actual (as opposed to historical) use, we created an index based on the three sets of data obtained in the interviews: known medicinal plants (K), plants used in the last year (U) and plants perceived as important (P). Each mention on each list gave the species one point, for a maximum of three points. The question on "plants used in the last year" may be considered controversial; people are often not very good at recalling events past the last 1-2 weeks accurately (Stepp 2010). Bernard et al. (1984) revised the literature on informant accuracy in remembering past events and commented "Be warned that the sum of all these reports can be very depressing to the behavioral scientist who relies on recall and report in lieu of more expensive forms of data collection such as participant observation or direct observation". He goes on to show that a large portion of answers to surveys are wrong; often people answer what they consider socially desirable or convenient. However, in our experience, illness was an outstanding event in our study area (not as common as Stepp (2010), reported for his study group in Chiapas) which people remembered. While some inaccuracy is inevitable, we do believe that the answers to this question reflect actual use better than mere knowledge of a plant as medicinal. The sum of these points, the Knowledge, Use and Perception Index (KUPI), reflected its relative importance. The Appendix lists the species with the KUPI for the two groups of interviewees, the healers and the general population. Please note that the index values or points are specific for this study and depend on the number of interviews. For comparative studies, the value would have to be divided by the number of participants. Then we integrated the results for the general population and the specialists - which we initially had separated - because we found that the most important species and the habitats from which they were obtained were similar in both populations. For example, Salvia microphylla was listed as a medicinal plant by 41 of the 55 interviewees (48 of the general population and 7 healers); 27 had used it in the last year and 21 felt it was an important medicinal plant. This results in 89 index points for the "Sum KUPI". Additionally, both the healers and the general population were asked about the conservation of medicinal plants in open interviews. We inquired what conservation meant for them, if they were interested in continuing access to medicinal plants and if they had done anything to assure their survival in the community. We also asked if they had noted any changes in the availability of these plants, both spontaneous and cultivated, during their lifetime. Classification of the Ecological Land Units. The most important local criterion for land classification was climate. Local people divided the land into two large types, "tierra caliente" (hot land, in Zapotec: "Yuú baá") and "tierra fría" (cold land; in Zapotec: "Yuú ziaág"). "Tierra fría" ranged from 1,300 to 2,000 m above sea level, and included the main community and the cloud forest areas, as well as two sacred sites, Las Cruces and La Cumbre. These sites were used for religious petitions and therefore called petition sites ("sitios de pedimento"). "Tierra caliente" covered more area than "tierra fría", and elevation ranged from 600 to 1,300 m. People subdivided these general types into units, which were named for geographical features, like creeks and rivers, land use or historical events. Only a few places had names based on dominant plant species, such as a part of the tropical forest dominated by the palm Chamaedorea tepejilote, named "tepejilotal". Soil ("tierra") was classified based on color and texture. There were two main types suitable for agriculture: red and black soil. People knew the plants that grow in "tierra caliente" and "tierra fría", as well as in these two soil types. They differentiated several landforms, especially "llanos" (flat areas), "cerros" (hills and mountains) and "lomas" or "hoyancas" (ridges). The population distinguished the following seven ecological land units: villages and roads, pastures, home gardens, cultivated fields, secondary vegetation ("acahuales"), riparian vegetation, and forests ("tierra caliente" and" tierra fría"). For this work, we used the classification outlined above but divided the forests into three types according to our observations: cloud forest (tropical montane rain forest, which correspond to the "bosques de tierra fría"), semi-evergreen tropical forest and evergreen tropical rainforest (which correspond to "bosques de tierra caliente", but were not differentiated by local people). Figure 4 gives an overview of the spatial arrangement of the vegetation types and Table 1 describes each ecological unit by its climate, soil type, management, useful products, indicator species and medicinal plants. Representative photographs of each ecological unit can be found in Supplementary Material 1. Figure 4 Distribution of the Ecological Land Units by altitudinal gradient. (1) Village and roads, (2) Pastures, (3) Cultivated fields, (4) Home gardens, (5) Cloud forest, (6)Semi-evergreen tropical forest, (7) Evergreen tropical forest (8) Secondary vegetation derived from cloud forests (acahual), (9) Riparian vegetation. Table 1 Description of the Ecological Land Units recognized in this study. The information includes location, products, indicator species (based on interviews; not necessarily dominant) and examples of medicinal species growing in the unit. The medicinal plants. Sixty medicinal plant species named in the free lists were registered and identified (Appendix 1). The most important plant families were Asteraceae, Lamiaceae, Rutaceae, Urticaceae and Verbenaceae. The most important species were Salvia microphylla (mirto) (89 KUPI index points), Lippia alba (pitiona) (59), Artemisia absinthium (hierba maestra) (46), Eupatorium sp. (juquelite) (36), Ruta graveolens (ruda) (31), Tanacetum parthenium (Santa María) (30), Verbena litoralis (verbena) (27), Aloe vera (sábila) (26), Matricaria recutita (manzanilla) (22) and Urtica chamaedryoides (chichicastle) (22). Of these 10 most important species, five were introduced plants, cultivated in the home gardens. 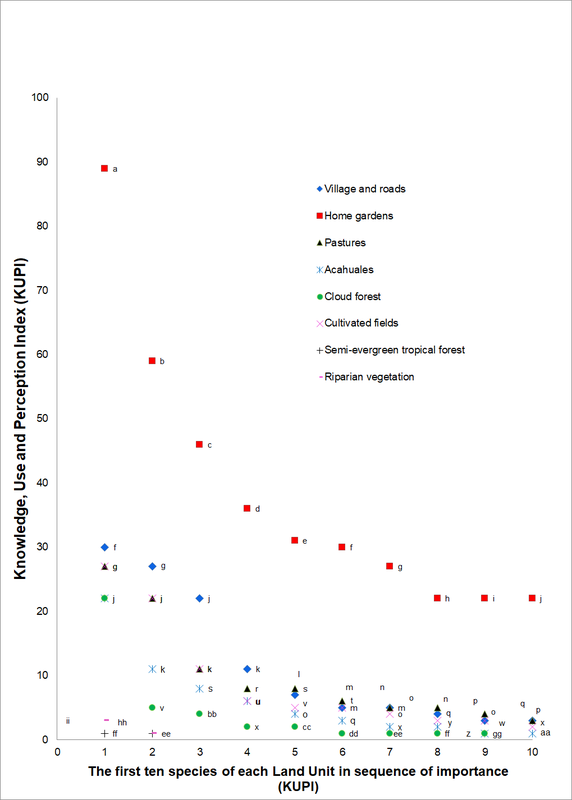 Figure 5 shows the ten most important medicinal plants for each Ecological Land Unit, ordered by the combined importance index (KUPI) for both groups of interviewees. Table 2 shows the ten most important species, separate for the healers and the general population (the full data are available in the Appendix). Figure 5 The most important medicinal species of each Ecological Land Unit, ordered by their importance index value. The evergreen tropical forest is not represented, as it had very few medicinal species. a: Salvia microphylla (mirto), b: Lippia alba (pitiona), c: Artemisia absinthium (hierba maestra), d: Eupatorium sp. (juquelite), e: Ruta graveolens (ruda), f: Tanacetum parthenium (Santa María), g: Verbena litoralis (verbena), h: Aloe vera (sábila), i: Matricaria recutita (manzanilla), j: Urtica chamaedryoides (chichicastle delgado), k: Bacopa procumbens (susto de suelo), l: Pilea microphylla (cuangracia delgada), m: Oenothera rosea (flor rosa), n: Cuphea aequipetala (flor morada), o: Sida rhombifolia (malvarisco), p: Psidium guineense (huesina), q: Malva parviflora (malva), r: Citrus sinensis (naranja), s: Persea americana (aguacate), t: Citrus aurantiifolia (limón), u: Ocimum micranthum (huele a rellena), v: Peperomia peltilimba (cuanyia), w: Borreria suaveolens (riñonina), x: Liquidambar styraciflua (llavito), y: Boehmeria caudata (tlaca), z: Plantago major (llante), aa: Calea urticifolia (cuanshia), bb: Dichaea neglecta (espinazo de culebra), cc: Pityrogramma calomelanos (ocopetatillo), dd: Odontosoria schlechtendalii (susto de lumbre), ee: Pinguicula moranensis (cuangracia gruesa), ff: Quercus elliptica (encino), gg: Magnolia dealbata (súchil), hh: Passiflora sp. (susto de trompa de víbora), ii: Equisetum myriochaetum (cola de caballo). Table 2 The ten most important species of the healers and of the general population, according to the KUPI index. KUPI = M + U + I where M-plants known, U-plants used in the last year, I-plants considered important. Habitat: 1-Village and roads, 2-Pastures, 3-Home gardens, 4-Cultivated fields, 5-Acahuales, 6-Cloud forest, 7- Semi-evergreen tropical forest, 8- Evergreen tropical forest, 9-Riparian vegetation. For the full table, see the Appendix. The main source of the most important medicinal species was the home garden. Species that grew in other types of secondary vegetation - pastures, fields and acahuales - followed. Few medicinals were obtained from forests or less disturbed vegetation. People attributed this to the fact that the forests were far away and difficult to get to in case of necessity - they preferred to have their medicinal plants at hand, though the cloud forest was, in fact, quite easy to reach. The most important species from forests, all native, were Dichaea neglecta (espinazo de culebra) (4 KUPI index points), Liquidambar styraciflua (llavito) (2), Equisetum myriochaetum (cola de caballo) (3), Pinguicula moranensis (cuangracia gruesa) (1), Peperomia peltilimba (cuanyia) (5) and Quercus elliptica (encino rojo) (1). However, they were not of sufficient interest to merit consideration when contemplating changes in land use. While most medicinal plants had a relatively low importance value, the relevance of mirto, Salvia microphylla, used for stomachache, diarrea, indigestion, "susto" (the syndrome) and menstrual pain, was striking and unexpected, but coincided with general observations. We also observed that personal interest influenced perceived importance. For example, the bonesetter felt that Sida rhombifolia, used for bone fractures, was very important, while the general population focused on species used to treat conditions “that the doctor doesn't attend” (culturally defined syndromes) and common ones, particularly digestive tract disorders. Table 3 shows the motives and activities people reported for conserving medicinal plants. Motives were mainly those mentioned above - people wanted to have easy access to plants that were important for them, such as those used to treat culturally defined syndromes, "susto" and "mal de ojo" (e.g., Dichaea neglecta, espinazo de culebra, and Pityrogramma calomelanos, ocopetatillo), which grow in the cloud forest, or Pilea microphylla (cuangracia) which grows near houses. The main conservation activities were transplanting and leaving them undisturbed during general agricultural work; both took place only in secondary vegetation. Table 3 Conservation activities of the population of Santiago Camotlán, Oaxaca. People had observed that several species had become less common, particularly cloud forest medicinal plants, for example, Equisetum myriochaetum (cola de caballo), Magnolia dealbata (súchil), Quercus elliptica (encino) and Valeriana candolleana (bejuquito de la disipela delgada). The main reason given was deforestation for cattle pasture. The healers and some other people had tried to transplant the forest species Equisetum myriochaetum (cola de caballo) and Pinguicula moranensis (cuangracia gruesa) without success and expressed certain concern about maintaining these species in their natural habitat. They had not, however, taken any concrete action in this direction, such as convincing assemblies. Some populations of cultivated plants, such as Gardenia jazminoides (gardenia) and Artemisia absinthium (hierba maestra), had also decreased. People would like to grow Citrus medica (cidra) and Citrus limetta (lima de ombligo), but only one garden owner had been successful. On the other hand, some species had expanded. Aloe vera (sábila) had been introduced to the region about five years earlier, and could now be found in almost every home garden. Pteridium sp. (ocopetate), a weedy plant that colonizes cultivated fields and old fields, had increased considerably. Local people were particularly interested in multiuse plants - especially those that were not only medicinal, but also edible. Those species, such as llavito, encino, súchil and huesina, were actively managed because they had other uses, not for their medicinal properties. Several women observed that the use of herbicides on roadsides, "acahuales" and fields had reduced the populations of wild medicinal plants. Both men and women noted that the expansion of cattle ranching had had the same effect, particularly on weedy medicinals. Another relevant detail was the belief that sacred sites should not be disturbed - this would have a negative impact on the efficiency of religious petitions. Classification of the Ecological Land Units. The traditional climate, vegetation and soil classifications in the study region were similar to those of nearby areas inhabited by Mixes and Chinantecos, though there were some differences in the complexity at the highest level. For example, Martin (1993) reports that in neighboring areas people distinguished "tierra caliente", "tierra fría" and "tierra templada" (temperate land). The same author reports five Chinanteco categories for the same mountain region: hot and humid, hot and dry, temperate and humid, temperate and dry, and cold. However, the Zapotecs in the Southern Mountains (Sierra Sur) of Oaxaca distinguish only cold-humid and hot-dry climate types (Luna-José 2006, Luna-José & Rendón-Aguilar 2012). There are two possible explanations: 1. Zapotecs, in general, recognize fewer climate types, and 2) a more complex classification had been lost in the study community due to the cohabitation of several ethnic groups for which Spanish is the lingua franca, possibly causing loss of vocabulary. The local population classified vegetation into seven categories, mainly based on use or management type. A classification reported from the Isthmus Zapotecs and Mixes was similar in its criteria; the population distinguished village, home gardens, roadsides, maize fields, corral, pasture, coffee plantation, forest and mountains (Frei et al. 2000). However, other studies report the use of physiognomy and dominant species in naming vegetation. Luna-José (2006) and Luna-José & Aguilar (2012) indicate that the Zapotecs of the Sierra Sur classify vegetation by its physiognomy and degree of disturbance, and the Mixes and Chinantecs of the Sierra Norte use physiognomy, habitat and composition of the flora (Martin 1993). Another criterion, reported from Ethiopia, is density of the vegetation (Megersa et al. 2013). No unifying principle could be identified for classifying vegetation in the region. Local empirical soil classifications in central and southern Mexico usually consider texture, color, consistency, moisture retention, ease of agricultural work, fertility and salinity (Ortiz-Solorio & Gutiérrez-Castorena 2001). This was confirmed in our study area: the farmers of Camotlán recognized soils by color, texture and their potential for agriculture. Martin (1993) reports similar criteria for the nearby Mixes and Chinantecos. Medicinal plants. Our index was useful for differentiating those species that were important in everyday life, according to the local population, from those that were used only occasionally. We suggest that other criteria frequently used in indices, such as simple numbers of use reports (which may be historical) or number of uses, are less accurate for this purpose, though they may be correlated (see, for example, Tardío & Pardo-de-Santayana 2007). The results clearly showed that relatively few species dominated the medicinal plant needs, both of the general population and the healers. Most medicinal plants were obtained from secondary vegetation, particularly home gardens. This contrasts with results from regions outside of Mesoamerica, such as Patagonia, the Caatinga of Brazil, the Himalayas and some parts of Africa (Albuquerque 2006, Adnan & Hölscher 2012, Kandari et al. 2012, Molares & Ladio 2012). However, it coincides with the results of Frei et al. (2000) for Isthmus Zapotecs and Mixes, and other parts of Mexico and the world (Stepp & Moerman 2001, Stepp 2004, Rokaya et al. 2012). None of the medicinal species obtained from forests was sufficiently important to motivate forest conservation. This could be due to several factors. We suggest that ordinary people only self-medicate with medicinal plants for well-known and recurrent conditions - and have the plants they need for this at hand. If they have more serious or rare complaints, they either consult the clinic with its Western-style medicine, or the traditional healers. These healers, particularly the traditional doctor, knew many more plants than those listed here, and obtained some of them from forests; the sites of these species were sometimes kept secret. However, the rarity of this type of events, and the lack of political power of the healers, did not allow translation of this need into conservation measures. Most medicinal plants in Camotlán were native, though the proportion of introduced plants was considerable, particularly among the most important species (as mentioned, five of the ten most important species were introduced, see the species list in the Appendix). The same observation has been made in most places where this question has been studied (Mexico, Argentina, Mozambique, Brazil (Estomba et al. 2006, Coelho-Ferreira 2009, Bruschi et al. 2011), with very few exceptions (de Almeida et al. 2010). This shows that people regularly use their own surroundings for their medicinal plant needs, but adopt new plants rapidly (see the Aloe example) if they satisfy a need. All of the introduced species grew near houses, as elsewhere (Albuquerque & Oliveira 2007, Almeida et al. 2010). Conservation in the sense of scientists or the urban population was a foreign concept to most community members. Only those that have been in contact with external agents, like people with a function in the local government, had a concept of species conservation, mainly because of payments for environmental services that the community received (and which has led to a ban on felling trees, but did not influence access to medicinal plants). However, the interviewees did have a concept of caring for their forests. As mentioned above, altering the sacred sites was considered particularly damaging; this has also been reported elsewhere (Colding & Folke 2001). However, this factor only applies to relatively small areas. Most people observed decrease in some species and increase in some other useful species. For example, one useful citrus fruit (cidra) from the gardens was disappearing, probably because of climatic inadaptation, but sábila (Aloe) was increasing. Susto de trompa de víbora (Passiflora) from the cloud forest had lost populations. It was mainly specialists who were somewhat concerned about the disappearance of important plants - those considered important for treatment of serious illnesses or had multiple purposes. However, they did not actively conserve them (apart from trying to transplant them). Megersa et al. (2013) reported a similar phenomenon in Ethiopia. People did not associate the habitat of the medicinal plants with their efficacy as has been reported from Patagonia, Argentina, where plants growing in undisturbed vegetation were considered to have better medicinal properties (Molares & Ladio 2012). The value of a medicinal plant was determined by the rapidity of patient response and by the number of ailments it could be used for. Active conservation was only observed for multipurpose species where other uses were perceived to be more important, like food or fuel. We suggest that food use as a driver of conservation should be explored further. Our study shows that medicinal plant use does not necessarily motivate forest conservation. Perhaps this was partly due to particular circumstances in our study area: the humid vegetation possibly does not contain as many medicinal plants as arid vegetation types (see, for example, Argueta-Villamar 2009); a traditional medical system that emphasizes herbaceous plants and uses few barks and roots (Argueta-Villamar 2009; also see the suggestion of Albuquerque (2006) that barks and roots are more important in semiarid vegetation types); and acceptance of the services offered by the local clinic, which reduced demand. If one of these circumstances had been different, the outcome could have been different also. Based on our study, in Santiago Camotlán, Oaxaca, Mexico, secondary vegetation harbored the most important medicinal plants. Of the natural vegetation, only cloud forests provided a few of these species. The level of use and importance of plants from conserved forests was low. The conservation of medicinal plants in their natural habitat was not a subject of much interest for the local population, or a factor in decisions on land use. There were, however, differences in perception and interest within the population. Conservation of some sites was motivated by religious beliefs. People and healers were most interested in conserving multi-purpose plants that were easily accessible, preferably cultivated in gardens; this, of course, is a form of conservation. A few species that could not be cultivated and thus would have to be conserved in their natural habitat existed, but they were not high-priority species. This means that conservation strategies based on medicinal plants as non-timber forest products cannot be recommended universally, but have to be analyzed on a case-by-case basis. In our study area, the three main factors influencing the use of medicinal plants (vegetation type, demand and the characteristics of the traditional medicine) were not favorable for forest plants. The influence of these factors may be different in other parts of Mexico and the world. Perhaps in the future, when we have better data on the usefulness of local floras, their relationship with their environment, and characteristics of traditional medical systems, we will be able to make predictions. We thank the population of Santiago Camotlán for sharing their knowledge, beliefs, traditions and laughter. In particular, we would like to thank don Abel for the field walks and the stories, don Jacobo, don Esteban and doña Eloisa for helping the first author to collect plants, for looking out for her and guiding her in the mountains; the family Ruiz Aparicio received her in their home with hospitality and friendship. The healers entrusted her with their knowledge of life and plants. The Gustavo Ramírez, Jazmín Galicia, René Aguilar, Cristina Alanis, Juan Ramírez, Mariana Vázquez, Marina Hernández, Omar Quisehuatl, Adriana Pacheco and Edgar Yañez helped with friendship and field work. Dr. Stephen Koch helped with species identification and MC. Ricardo Vega with the herbarium work; Dr. Rafael Lira identified a species of Cucurbitaceae. Finally, the people of Mexico, through the Consejo Nacional de Ciencia y Tecnología, supported the first author through grant 327196 for two years. List of the medicinal species cited in the interviews: Scientific name, family, common name, Ecological Land Unit, origin (native/introduced) and value of the Knowledge, Use and Perception Index. The species are ordered by their value of the Knowledge, Use and Perception Index from most to least important. Ecological Land Units: 1-Village and roads, 2-Pastures, 3-Home gardens, 4-Cultivated fields, 5-Acahuales (secondary vegetation), 6-Cloud forest, 7- Semi-evergreen tropical forest, 8- Evergreen tropical forest, 9-Riparian vegetation. Origin: N-Native, I-Introduced, U-Unknown. KUPI: Knowledge, Use and Perception Index. An asterisk * indicates the cultivated species (n=14) that were not collected but identified in the field. Sum KUPI - sum of healers + general population, used for Fig. 5, and for ordering the species list. * Corresponding author: Heike Vibrans, e-mail: heike@colpos.mx. Author contributions: All authors collaborated in conceiving and designing the study, as well as in the analysis of the data; they reviewed the various versions of the paper. MPN did the field work and the interviews, collected and identified the plants (some with the help of colleagues indicated in the paper), and wrote the first Spanish-language version of the paper. HV wrote the English version.